Product #17682 | SKU WPC-1OR | 0.0 (no ratings yet) Thanks for your rating! 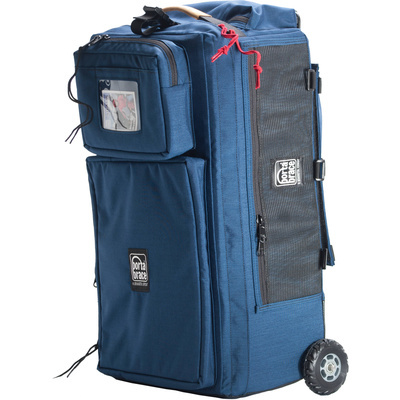 The small signature blue WPC-1OR Wheeled Production Case from Porta Brace is made for transporting all kinds of heavy loads for studio, audio, video and film equipment. The cases are designed to be used for handling gear on location as well as transporting apparatus to the job site. They are constructed of a strong ridged interior frame covered with 1000 denier Cordura nylon fabric, with padded protection all around. The WPC-1OR has off-road inline skate wheels with strong steel axles for improved stability and traction. A retractable telescoping steel handle is mounted on top for portability. A divider kit is provided which allows customizing of an infinite number of storage compartments. A LI-GLW illumination strip light pocket is included. Divider kit is provided which allows customizing of an infinite number of storage compartments.